Buying train tickets in Portuguese. Can I have a ticket to Lisbon please? Today we'll be learning a new thing: buying train tickets in Portuguese. 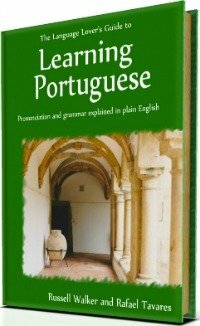 If you want to purchase a good Portuguese phrase book, which I recommend you to have at hand, you may want to click the picture on the right, which is an affiliate link. Otherwise, read on. I know. It is quite embarrassing when we travel to a country and we don't know how to handle buying train tickets, isn't it? 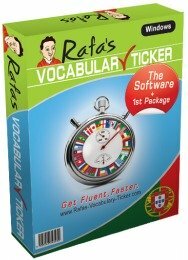 I can tell you that it is quite easy and once you practice the pattern and repeat it a few times on your own, you won't have any problems in buying train tickets in Portugal, Brazil or any other Lusophone country. 1. You have to know what you want to ask for. 2. You have to know how to predict what the ticket officer is likely to ask you. 3. You have to know how to downplay what is not relevant for you when you are buying train tickets. When you are buying train tickets you obviously need to know where you want to go (the city or the station name). You also need to know what time you want to travel, so words like "cedo" (early) / "mais cedo" (earlier) and "tarde" (late) / mais tarde (later) have to be fresh in your memory in order for you to be ready to use them. a) Fast trains - Serviço Rápido also called Alfa - which normally stops at main cities. b) Intercity service - Serviço Intercidades - which stops at every city along its itinerary. 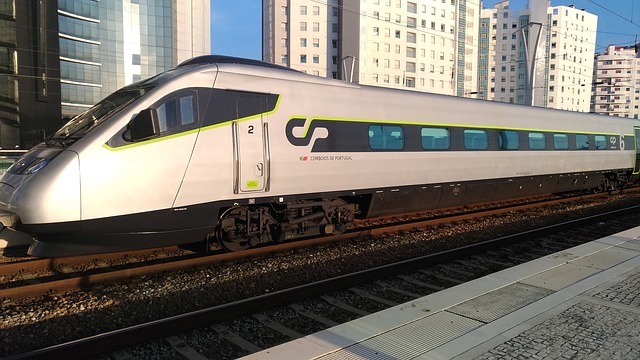 c) Regional or inter-regional service - Serviço Regional or Serviço Interregional - which stops at every 1 or 2 main stations of each city. In the first 2 services you can buy either - Bilhete de Primeira Classe or Bilhete de Segunda Classe (1st or 2nd class tickets). You can also choose Janela (window) or corredor (aisle). I have recorded three situations to show you Maria buying train tickets in Portuguese. First a return ticket, then a single ticket, and lastly asking to pay with a credit card. Listen to them first without reading. Then listen to the dialogues following the text. Finally, read the English translation if you need to. Try to convince yourself that buying train tickets is easy! So, are you ready? Here you go! Click the green arrow. - A seguir. Bom dia! - Next please. Good morning! - Bom dia. Queria um bilhete para Lisboa para amanhã de manhã. - Good morning. I'd like a ticket for Lisbon for tomorrow morning. - Para amanhã de manhã? No Alfa, no Inter-Cidades, no Inter-regional...? - Tomorrow morning? On Alfa, Inter-cities, Interregional...? - Ehh, eu queria Inter-Cidades. É mais barato, não é? - Amm, I'd like Inter-cities. It's cheaper, isn't it? - É mais barato que o Alfa, sim! - It's cheaper than Alfa, yes! - OK. Eu queria ida e volta. - OK. I'd like a return ticket, please. - Ida e volta... Muito bem! De manhã ou à tarde? - Return... in the morning or afternoon? - De manhã, se tivesse. - In the morning if you had (if possible). - Ehh... tem sim. Ora... tenho um comboio às dez e cinquenta e dois (10:52am). - Amm... Yes. Amm... there is a train at 10.52am. - OK. E queria para voltar no dia seguinte. Qual é o... o horário? - OK. And I'd like to return the following day. What is the timetable for that one? - De manhã, ou de tarde? - In the morning or afternoon? - Ehh... Ora à tarde tem um às dezoito e vinte e oito (18:28). - Amm... There's one at 18:28. - Mas eu queria directo. - But I'd like a direct train, please. - Pois o das 18.28 a senhora tem que mudar em Coimbra B. - Yeah,the 18:28 train you have to change at Coimbra B. - Não. Eu quero directo. Qual é o horário do directo? - No. I want a direct one. What is the timetable for this one? - O directo é um pouquinho mais cedo. É às cinco horas (5:00). - The direct one is a little bit earlier . It's at 5:00pm. - That would do, then! - Muito bem. Então, amanhã para Lisboa às dezoi... às dez e cinquenta e dois, e voltar no dia seguinte às dezassete horas (17:00). - Very well. So, tomorrow for Lisbon at 10:52, and return the following day at 17:00. - Ora, o preço são quarenta e dois Euros (€42.00). - Ehh, primeira ou segunda classe? - Is it first or second class? - Não! Estou... Estamos a falar de segunda classe. A senhora prefere de primeira classe? - No. We are talking about 2nd class. Do you madam prefer 1st class? - Não. Eu quero segunda classe. - No. I want 2nd class. - Muito bem. Ehhm... Janela ou corredor? - Very well. Amm... window or aisle? - I'd like window, please. - Janela? Sim senhor! Aqui tem o seu bilhete! - Window, right? Here you have your ticket! - Aqui tem o seu troco! - Here you have your change. - Obrigado e bom dia! - Thank you and have a nice day! Hey! 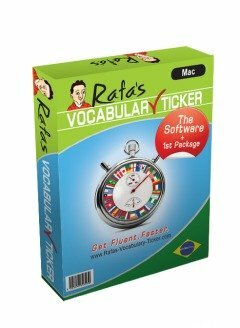 Have you noticed that the words "para", "Então" and "Obrigada" are highlighted? That's because these words often run together with the next word or are swollen when the native speakers speak? Listen to it again and check it out! This time Maria continues buying train tickets and she interacts differently with the ticket officer. Remember to check it out and take your notes. You must create your own pattern. - Bom dia, queria um bilhete para o Porto. - Good morning. I'd like a ticket for Porto. - Temos o Alfa Pendular às duas horas (2:00pm). Temos Inter-Cidades às duas e trinta e três (2:33pm). - We have Alfa at 2.00pm. We have the Inter-cities at 2.33pm. - Qual é que é mais rápido? - Which one is faster? - O Alfa-Pendular é mais rápido, sim. - The Alfa (Pendular) is faster, yes. - Ehh, demora que? Duas horas? - Ammm... It takes how long? Two hours? - Menos de três (3) horas. Duas horas e quarenta e cinco minutos mais ou menos. - Less than three hours. Two hours and 45 minutes, more or less. - Qual é o preço? - Ehh, primeira classe ou segunda? - Amm... first or second class? - Ehh, pode ser primeira classe. - Amm... it may be first class. - Primeira classe são quarenta Euros e cinquenta (€40.50). - First class it' s €40.50. - E... Quanto é que é a segunda classe? - And... how much does second class cost? - A segunda classe é mais barata, são duuu... são vinte e oito e cinquenta (€28.50). - Second class is cheaper. It's twenty eight fifty. - E não é muita diferença, ou é? Em termos de conforto...? - And it's not that different, is it? In regard to comfort? - Então queria segunda classe..
- In this case, I'd like second class (please). - Amm... does it have any windows available yet? - Então eu queria janela. - In this case, I'd like window (please). - Muito bem. Segunda classe, janela... Ida e volta? - Certainty. Second class, window... return? - Sim senhor. São vinte e oito e cinquenta, se faz favor. - OK. It's twenty eight fifty, please. Great stuff, isn't it? I love it! Have you noticed that you don't have to say "please" all the time in Portuguese, not even when you are buying train tickets? When you are buying train tickets you say "please" with the tone of your voice. Check it out again! Check it out when she is asking for information buying train tickets. When ready, jump to situation 3. This is another good example of how you can be buying train tickets in Portuguese. In the following situation you will here Maria buying train tickets, once again, but this time she wants to pay with a credit card. Continue buying train tickets with Maria by pressing the green arrow. - A seguir... Bom dia! - Bom dia. Queria um bilhete para Aveiro. - When would you like it for? - Queria para hoje de manhã, e voltar hoje à tarde. - I'd like to travel this morning and return this afternoon. - Hoje de manhã, temos um às dez e cinquenta e dois (10:52am), temos outro às onze e catorze (11:14am). - This morning there is (we have) one at ten fifty two, there's another at eleven fourteen. - Ehh, mas eu queria o Inter Regional. - Amm, but I'd like the inter-regional service (please). - Sim. É o Inter Regional. - Yes. It's the inter-regional service. - Dez e cinquenta e dois (10:52am). - Para voltar, tem um às dezanove e dezanove . - Return, you have one at 19.19. - And, what's the price, (please)? - Ehhh... Ida e volta? - Sim, ida e volta. - São dezanove Euros (€19.00). Estamos a falar de segunda classe. - It's nineteen Euro. This is (we are talking about) second class. - Sim. Eu não estou interessada na primeira classe. Ehh... posso pagar com o cartão? - Yeah. I'm not interested in first class. Can I pay with a card? - OK. Obrigada. Então queria o bilhete. - OK, Thanks. I'd like to have it, then! - Ora o bilhete para amanhã às dez e cinquenta e dois (10:52am), e voltar às dezanove e dezanove (19:19).... Muito bem, por favor, marque o seu código. - So, a ticket for tomorrow at ten fifty two, and return at nineteen nineteen... Done! Please digit your code. - Muito obrigado... Aqui tem o seu bilhete. - Thank you very much... here you have your ticket. Hey, but remember, if you do that's a good sign! Before I finish, have you taken your notes? Do you know what to say to the ticket officer when you are buying train tickets? Any comments, please do not hesitate to contact me by clicking here. See you next time and have a great journey! Go Back from Buying Train Tickets To Free Lessons.